The QB50 project is an European-funded research program to launch 50 cubesats to carry out the most extensive measurements ever undertaken of the lower thermosphere (between 200 and 380km), a layer of the atmosphere which has been poorly studied. This is because it is hard to reach: the only other way for sensing this region is to deploy a single satellite in a highly elliptical orbit (which is very expensive as it won’t last long), or using sounding rockets, which last only a few minutes; both of these methods provide very sparse single-point measurements. The QB50 satellites will collect extensive measurements over a very long period. Number of satellites: 50 double and triple cubesats contributed by various countries around the world. For the list of teams, see here. Launch: The UNSW-EC0satellite – along with the other QB50 satellites – will be launched by an Orbital ATK Antares rocket in December 2016 from Wallops Island, Virginia, USA (video footage available). They will be housed inside a Cygnus cargo freighter carried by the rocket. Deployment: The satellites will be deployed from the International Space Station, or ISS, by the Nanoracks CubeSat launcher, a rectangular tube that fires the satellites from the ISS safely, between one and two months after arrival. The will then be released into an orbit at 380 km initial altitude, the same as the ISS (video footage available). The satellites will collect data for between 3-9 months (but may last 12 months) in orbit in this little-studied region of space, collecting measurements in the kind of detail never before tried. Their orbits will naturally decay, and it will eventually re-enter Earth’s atmosphere and burn up. 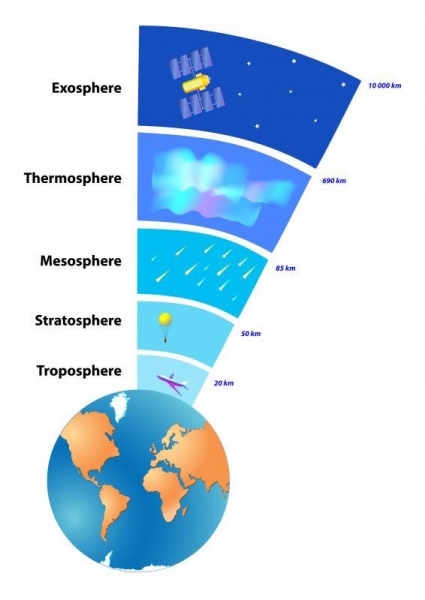 As the satellite orbit decays, the satellite will measure various points of the thermosphere and will send measurements to the worldwide network of ground stations. In addition to the scientific objectives of the QB50 mission, each team has their own engineering and scientific goals for their own satellite, that occupy the remainder of the available payload space. Two other Australian satellites are part of QB50: i-INSPIRE II, a joint project between the University of Sydney, UNSW and the Australian National University and manufactured at UNSW’s Australian Centre for Space Engineering Research; and SUSat, a joint project between by the University of Adelaide and the University of South Australia. The UNSW contribution to the QB50 project began in 2012, with a boost of $250,000 secured for the project by Dr Elias Aboutanios. The satellite, named UNSW-EC0, will carry an Ion Neutral Mass Spectrometer instrument to study the composition of the thermosphere. Random atoms striking the on-board detector will be stripped of electrons, allowing the instrument to identify what elements they are. This level of detail, over such a long period of time, has never been undertaken before. The seL4bit SBC: This a computer chip with a super reliable capability-based microkernel, the kind used on many mobile phones and other computing devices. Developed by CSIRO’s Data61 and UNSW’s Prof. Gernot Heiser, it is the most reliable core of computing which is going into space for the first time, to test its computing reliability when exposed to the harsh radiation of space. RUSH FPGA: Cosmic rays and solar flares often scramble computer chips, forcing them to reboot to recover. This robust chip – a Field-Programmable Gate Array developed at UNSW – is designed to self-correct errors caused by random cosmic rays, allow rapid recovery from a glitch without shutting down or stop what it is doing. This potentially novel, and valuable, approach is being tested in space for the first time. RAMSES: Part of the experiment is the satellite’s chassis, built using 3D-printed thermoplastic. This will test the viability of manufacturing satellites from 3D-printed parts in the harsh environment of space (RAMSES stands for Rapid Manufacture of Space Exposed Structures). Dr Elias Aboutanios: the UNSW-EC0 satellite. Prof Andrew Dempster: overview of the QB-50 project, the thermosphere and other satellites. UNSW-EC0 cubesat in space: Three high-res animations of the UNSW-EC0 in space; a) being deployed from the ISS, b) floating above Earth near an aurora, c) video graphic of the thermosphere region. Rocket launch (YouTube):Launch of anOrbital ATK Antares rockets similar to one that will be used for the QB50 launch in December 2016. CubeSat launcher (YouTube): Video from the International Space Station of the Nanoracks cubesat launch ‘cannon’ deploying small satellites. Team and testing:Photos of the UNSW-EC0 satellite, the team that built it and the shake and vacuum testing at the Advanced Instrumentation Technology Centre in Canberra. Click here for high-res photos. Please contact us directly for captions.